Normally I prefer to keep this place pretty well devoid of information about my personal life as I tend to be a pretty private person but I am facing a major family crisis right now and the only way I can help right now is by spreading the word. My sister-in-law is missing! 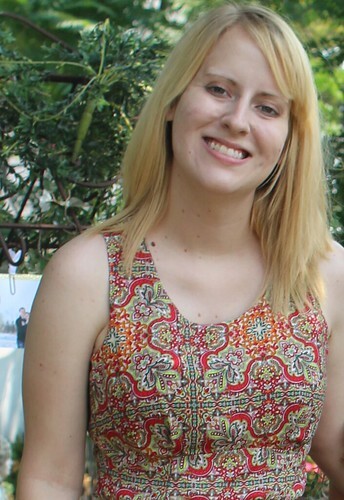 Her name is Chelsea Bruck, she has been missing for over a week now. 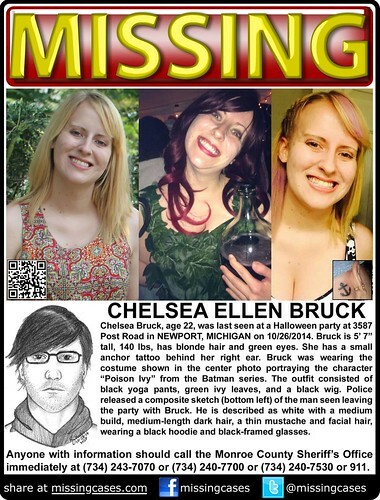 Chelsea attended a Halloween party on the 25th of October, she was last seen around 3 AM on the 26th at Post Road (where the party was held) in Newport, Michigan. This was a Halloween party so she was dressed up for Halloween, she was dressed up as Poison Ivy. No one has seen or heard from her since, she did not have cell phone or wallet on her at the time of her disappearance. I’ve seen a lot of vile comments elsewhere on the internet because one of the last pictures of her that surfaced was of her with a giant wine bottle but that was part of her costume, it had food coloring in it and a poison label on it because she was Poison Ivy haha, how cute and clever. She made the Poison Ivy costume herself. If you were at the party and know something please come forward, if you are hesitant about coming forward because of underage drinking/pot or whatever don’t be the cops aren’t going to care if you have information we desperately need it! We all just want Chelsea found. The story has started getting picked up on a national level, she’s been featured twice on Nancy Grace now and it’s spreading to more and more news agencies every day. Monroe is a small town, the community has been amazingly supportive of the family during this time of need. People have been amazing volunteering, putting up flyers, the bank where my mother-in-law works just recently changed locations and is allowing the family use the old location as a headquarters for the search parties (Monroe Bank & Trust – Newport Branch 8799 Swan Creek Rd, Newport, MI 48166). I really want to put emphasis on the fact that she is not wild and crazy party girl that would run off, the family is extremely close-knit she still lived at home and doesn’t even drive her parents drove her to and from work (why? well I seem to recall her parents receiving a panicked phone call a couple of years back while they were visiting when she backed the van out of the garage and into the garage door) . She is one of us, she loved Final Fantasy VII and VIII, her favorite anime is Fruits Basket and she is a huge Doctor Who fan. She is a really sweet girl, we need her home! I am not in Michigan, at least not yet. After much discussion with Chelsea’s brother/my husband it was decided that we should not tell our six year old daughter that her favorite aunt is missing until we know what happened for sure, I have chose not to alter her daily routine as I don’t want her to be stressed out she wouldn’t understand all this. For anyone interested in helping there is a facebook group which I help moderate (which is insanely time consuming I’ve been at it like 20-22 hours a day for almost a week now), a gofundme page. It would be a great help even if you just shared Chelsea’s missing flyer via social media with the hashtag #findchelsea . If you know anything or think you might know something I urge you to contact the sheriff’s department at 734-240-7700 or the crimestoppers tipline at 1-800-773-2587. We will not stop searching until Chelsea is found. The local sheriff’s department will hold a news conference at 1pm tomorrow. This entry was posted in Uncategorized and tagged michigan, missing, ohio. Bookmark the permalink. Thank you I’m still hoping and praying that Chelsea is found soon! Praying and watching for any signs every day. Hope she is home where she belongs very soon. Thank you! I keep hoping and praying she is somehow found safe soon.